Slow Food Denver Micro-Grant Application is Open! 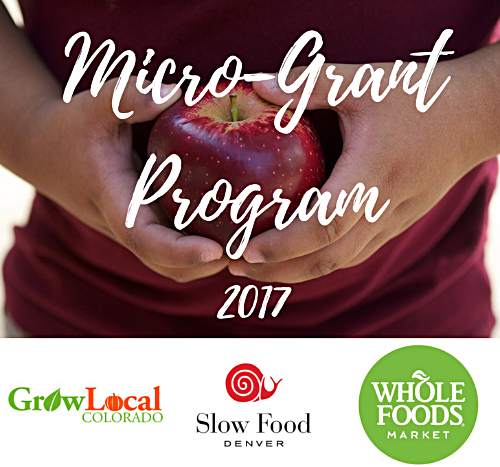 Slow Food Denver is pleased to announce our 2017 Micro-Grant Program to support innovative and sustainable food initiatives in the Denver Area. We are accepting applications from growers, producers and community organizations that aim to better Colorado’s food system and support the needs of the communities they serve. We encourage you to apply and to share this opportunity with individuals and organizations that you believe share the values of good, clean and fair food for all. After applications are submitted, three finalists will be selected. Each finalist will then present their projects to community members at a dinner this May where attendees will vote on the distribution of funds. Micro-grants will range in funds from $1,500 – $4,000.